← Just a walk on the beach……. This Halloween weekend was very interesting. 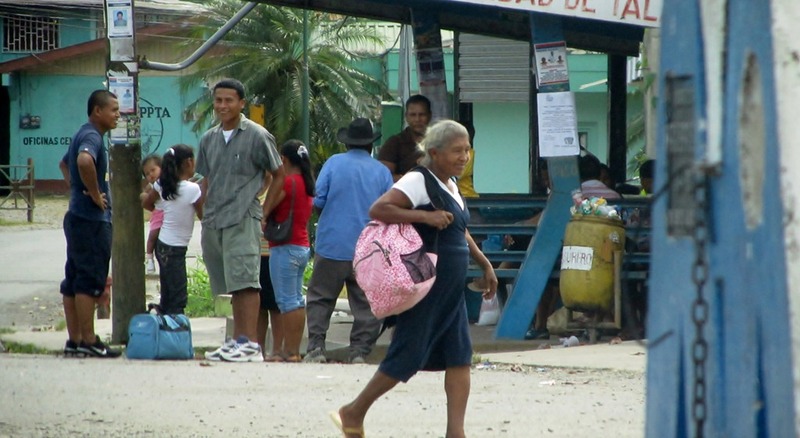 On Saturday something called the Tope came to Playa Negra which is the beach that is just a three minute walk from our house. 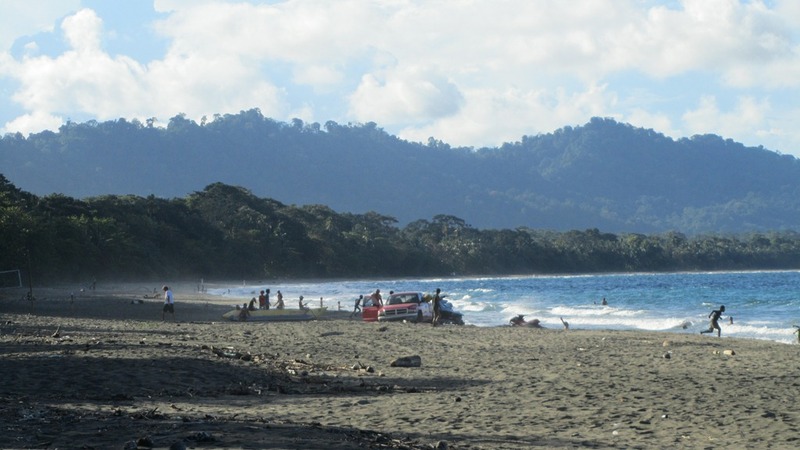 I have noted before how tranquil and un-crowded this beach is – not this weekend!!! 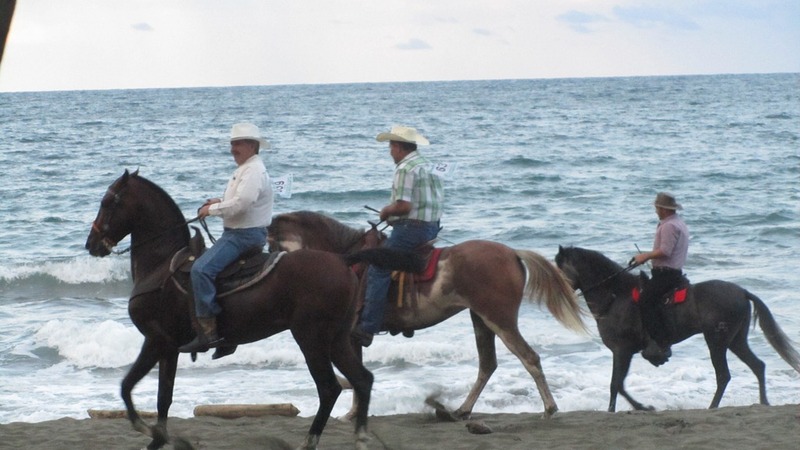 The Tope is evidently an event that brings horsemen and women from all over Costa Rica to one place to show off their horses and have a great time. The party starts mid morning when people arrive and fire up the barbeques. There is much food, beer, and soda consumed and a lot of people hanging out in the ocean and playing volleyball on the beach. 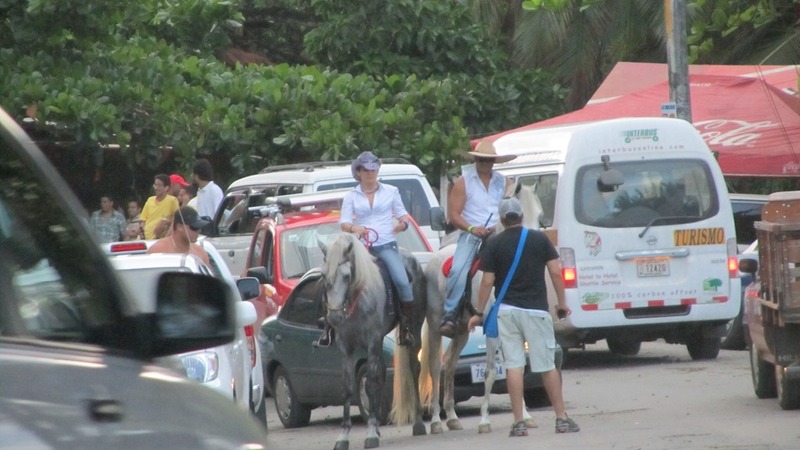 Then hundred of riders mount up and ride their horses along the beach into town and ride all around our little town stopping at bars, restaurants, and shops. 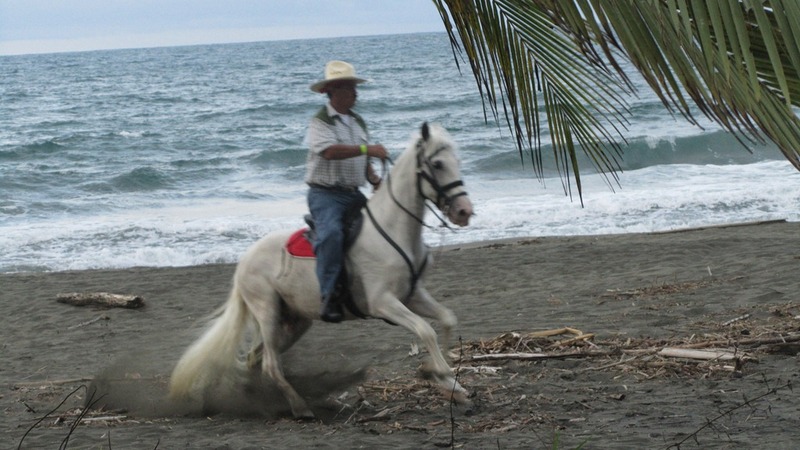 In the late afternoon they all come galloping back to the beach to finish up the festivities. Some of these horses were dancers and the riders led them through some of the most intricate moves I have ever seen. It was amazing to see a horse moving with as much agility as a small dog. There were cars and people (and horses and dogs) everywhere!! I thoroughly enjoyed walking along the street and taking pictures of everyone enjoying themselves. Sunday (Halloween) was one of the most gorgeous days we have had so far – and that is saying a lot since almost all days are beautiful. Once again people were out on the beaches and in town visiting and just enjoying life. Tom and I headed to Limon with about ten other people in our little choir to rehearse with the people in Limon who will be singing the Messiah with us on December 19th at the Limon Cathedral. The director was a task master but he really knew what he was doing. By the end of our three hours together we actually sounded pretty good!! It was interesting to see the difference in who was singing from what place. 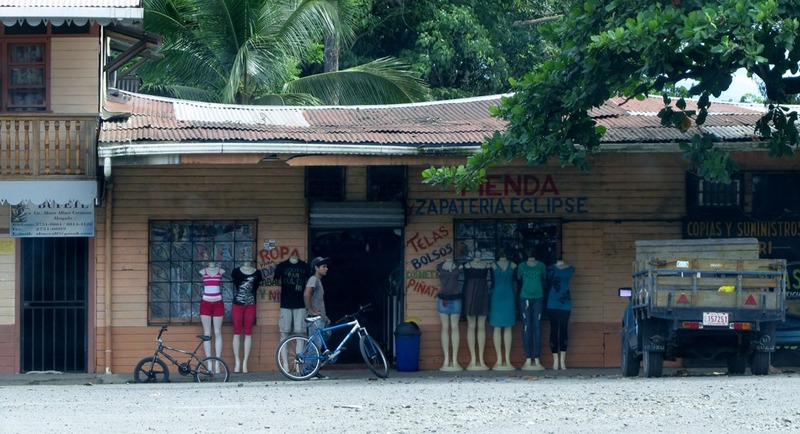 Those of us from Puerto Viejo were all in our 50’s and 60’s while those from Limon were much younger – mostly 20’s and 30’s. It was great fun. The director’s wife brought us homemade pumpkin tasting bread for the ride home and it was delicious! When we got back to PV it was apparent that the Halloween parties were just getting started. Evidently this is a big celebration here in town and many bars and restaurants have costume contests. We did not go out this year but we definitely will next year – it looked and sounded like a great time!! Yesterday, my friend Nancy asked if I wanted to go to Bri Bri (the county seat) with her so she could pick up some baby chicks and an artificial Christmas tree. 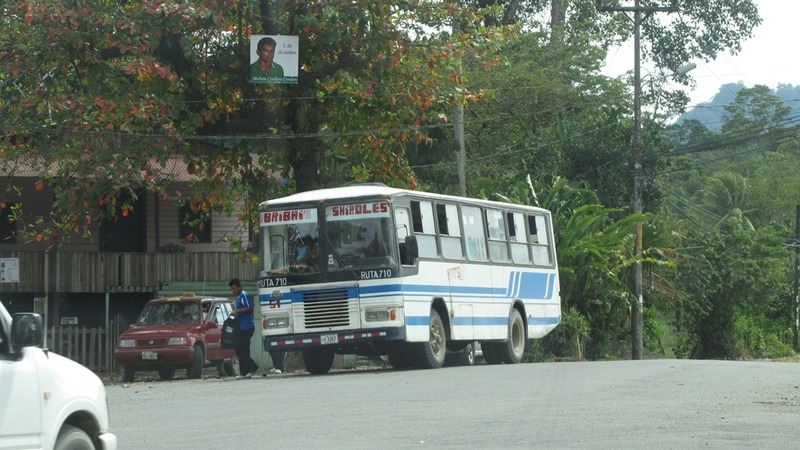 Bri Bri is about fifteen miles away in the mountains and is a very typical Tico town. Sharon, another friend, decided to come along as well so we headed out in the mid afternoon for a new adventure (at least for me). We got to Bri Bri and went to the veterinarian who sells the baby chicks. Nancy bought four of them and he put them in a cardboard box and tied them up. She wanted the chicks because one of her chickens at home had been sitting on four eggs for over thirty days and they were not going to hatch. But the hen would not leave the nest. A few years ago Nancy found that if she brought live chicks to the hen that was sitting on dormant eggs, then the hen would think the eggs had hatched and would tend to the chicks and get off of the nest. I thought this was hysterical! At any rate, we then went shopping at a variety of little stores and Nancy found her Christmas tree which happened to be the last one so they had to take it apart so we could buy it and bring it back. As we stopped in all of the stores, one of us would carry the chicks who were chirping away in their cardboard box. Now this is something I never did in Idaho – or Colorado – or Wyoming………… We headed back to PV and I dropped Nancy off at her house with the Christmas tree and the chicks. Sure enough that goofy hen saw those chick, got off her nest, and started herding them around. This is the life! !